Free-spirited Fleetwood Mac, the most famous British-American rock band of all time, is undoubtedly the most iconic soft rock group of the 70s. This sophisticated vocal and percussive group, with their lavish bohemian soft-pop harmonies, sold millions of records throughout the world. Stevie Nicks and guitarist Lindsey Buckingham made the music stage every hippie girl's dream, embodied by Stevie in her fantasy regalia, and surrounded by the very best rock artists of their time, Mick Fleetwood on drums, velvety vocalist/B-3/pianist Christine McVie and melody-driven basssit John McVie. 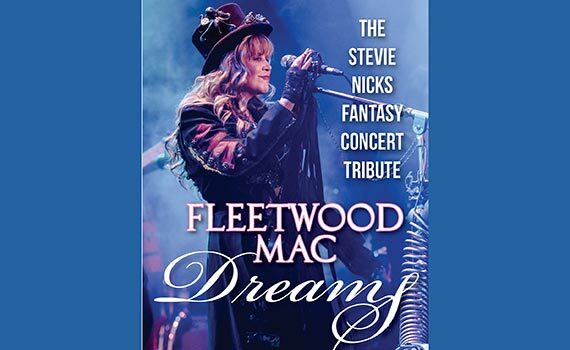 Go Your Own Way, Don't Stop, Little LIes, Gypsy, Rhiannon, The Chain, Stop Draggin' My Heart Around, Stand Back, Edge of Seventeen, and Dreams, are only a few of the hits you'll hear in this fantastic concert tribute to the legendary Stevie Nicks and Fleetwood Mac.